There’s a famous biblical proverb that states “The rich rule over the poor, and the borrower is slave to the lender.” I don’t know about you, but I’ve found that to be very true in life. I think this proverb provides a couple of insights into the mind of the “FIer“. First, debt is something that we do NOT want to have. And second, I would argue that those of us with an eye toward Financial Independence feel the burden of a larger volume of debt than most people do. The reason I say that is because the dream of financial independence has to do with both money and time. So for the FIer, this translates into two stages of debt (and the elimination thereof). When we get our starts in life, there aren’t many of us who are just handed a free education, a free house, or a wad of cash. And often those who are handed those things squander them away just like the rest of us would. So, we usually incur some debt in order to get our start in the world. School loans are extremely common. Most newlyweds in America have a mortgage. And it takes some serious cash to outfit ourselves for life in the working world. So at Stage 1, we go into (and begin to climb out of) Money Debt. This means that our net worth is negative, our debts outweigh our assets. If you read most personal finance blogs, you’ll find that many of them have to do with getting out of debt. Once we understand the impact of carrying debt, we begin to work like our hair is on fire to get out of it, and to try to build a positive net worth. I’ve charted out the conventional thinking about this debt, pictured below. But there’s something very different about the way that an FIer thinks about life. To us, not only is the borrower slave to the lender, but the rich also rule over the poor. When I look at my net worth and see a big fat $0, my first thought is not “heck yeah, I’ve made it!” I mean, being debt-free is awesome, and it’s what I’m striving for at this point in my journey, but I don’t see that as a “finish line” like lots of people do. When I get all my debt paid off (including my mortgage) my mindset won’t change to “now I can spend money like I don’t need it” mode. 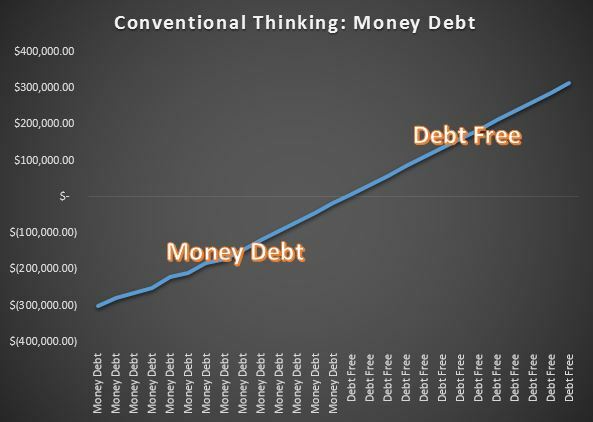 Stage 2 of the journey toward Financial Independence is very similar in nature to Stage 1, except that instead of Money Debt being the issue, we’re working on eliminating Time Debt. 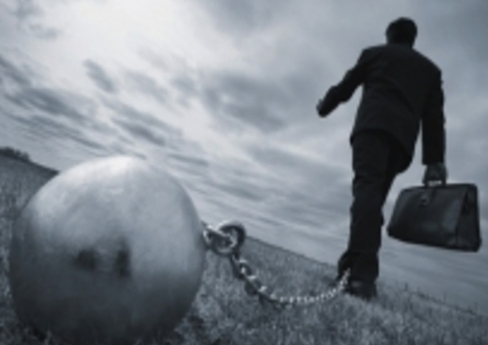 What is Time Debt? I’m glad you posed such a perceptive question! 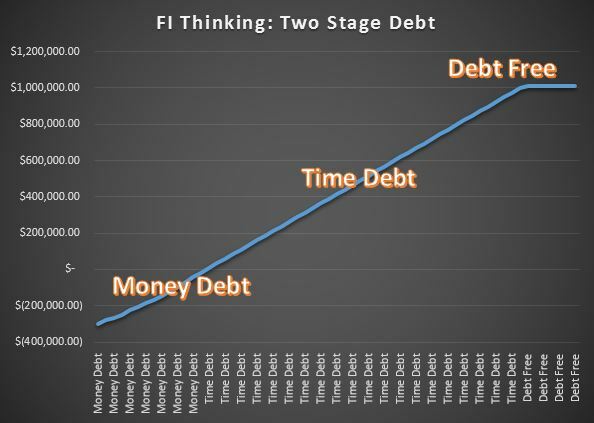 Time Debt is the stage of the FI journey where we are obligated to exchange our time for money. We are essentially in debt to an employer, company, or other money-making enterprise. We have to have money to live, and since we don’t yet have enough of it to sustain ourselves, we have to work for it! There’s a reason that this is an important distinction. Operating day-to-day with the mindset that “I’m in debt” causes you to make a lot of decisions about life that normal folks don’t. We see waste where others see normalcy. We see a golden future of independence instead of a slow march toward retirement. Once you see just how achievable FI is, you won’t be satisfied with a 45 or 50-year journey to retirement. Enjoying financial independence at age 70 isn’t what I dream of. I want to live in such a way that my time is my own to spend well before that. To read more about how Financial Independence works, check out the FI 101 series!